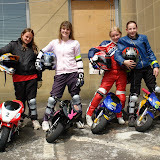 Due to the wet weather conditions the BikeWise Mini-moto event on Saturday 23rd June 2006, has had to be cancelled. Please keep watching this website for a new date to be set. Footage from Tyne Tees TV News item about Durham Police Motorcycle Section's work in the Durham Dales. Shows how vehicle's can be 'lost' behind the dry stone walls of the Dales roads which prompted the 'Wait A Second' campaign after a local rider was killed. Ladies Night are being held at the Police HQ , Aykley Heads, Durham throughout 2007. Further details can be found in the Events Section of the main BikeWise site. The BikeWise Mini-Bike Club will hold it's 3rd meeting at Durham Police HQ, Aykley Heads, Durham, on Saturday 23rd June 2007. Registration will commence at 10am with the Riders Safety Briefing taking place at 1030hrs. Late arrivals can NOT be accomodated due to the strict guidelines we operate under from the ACU. REMEMBER--the meeting will not be held in wet weather! Please indicate your interest on this blogsite. Mike 'Spike' Edwards from Harrogate is a top international motorcycle rider & also an ACU instructor. Mike travelled up to Durham at the beginning of the year & with the help of some colleagues taught us how to run the BikeWise Mini-Bike Club. Mike told us about 'Gordon', his project racing bike, a Yamaha SZR 660 which he bought off EBay for £454. Mike has rebuilt 'Gordon', with a little help from his 'friends'. BikeWise is one of Gordons friends so visit his Website & Blog and see how he is doing this year.